If you are doing bathroom conversions in a property to turn it into a bed and breakfast and you want to get the most out of your paying guests, there's nothing that can allow you to raise your room rates more than going en suite throughout. But as a conversion this is an expensive job, and in a bed and breakfast with small rooms it might not be possible, not without contravening hotel regulations. So, to en suite or not, that's one of the key questions facing many bed and breakfast owners at the moment. Hotel regulations don’t stipulate anything about the number of bathrooms and guest numbers particularly but the various tourist boards and holiday companies do. Visit Britain and its associated tourist associations now demand en suite facilities for every guest room in order to qualify for the five star standard, and even the minimum standard specifies that the bathroom facilities must be completely separate from the family that live in and run the bed and breakfast. Are Bathroom Conversions in a Bed and Breakfast Worthwhile? With the advent of microbore plumbing bathroom conversions are now possible in areas that were previously off limits. Work out if you have the room to put en suites in each bedroom, either by partitioning off one side, or a corner. If you can't do that you may have to consider sacrificing a smaller guest room to make one or two en suite bathrooms for the guest rooms either side of it. This is a difficult decision. Will it be worthwhile sacrificing the earnings from having paying guests in a single or small double room, to be able to charge higher room rates on two larger rooms once their bathroom conversions are finished? This needs to be calculated financially as well as taking into account where you are taking your B&B upmarket for discerning clientèle, or into the mass market. 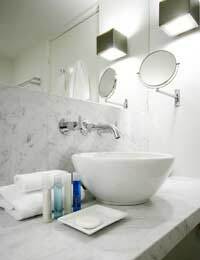 When choosing the fittings go for high quality and longer lasting suites. A bathroom conversion with a cheap suite is a false economy in a bed and breakfast if you have to replace them it three times faster than one that's only 50% more expensive. Also paying guests will remember, and talk about, poor quality for longer than they will remember low room rates. This applies to the taps and shower units too. If possible avoid showers that are positioned above baths and use clear panels for showers rather than shower curtains in your bathroom conversion. Make sure there are enough towel rails and hanging hooks to cover all the paying guests who will use the room. Cupboards and shelves for guests' bathroom bits and pieces is important, but make sure none of your cleaning products are in those cupboards. Drinking glasses should have holders and be replaced with clean ones on a daily basis. Hotel regulations do govern the health and safety issues in en suite bathroom conversions so make sure you take advice on this before you start the work. The local building inspector will come and take a look when it's done, and possibly when it's in progress, so it's worth making sure that compliance is designed in from the start – this avoids expensive and time-consuming mistakes. I can back this up - last feb we remodelled the top landing loosing 1 single room with a private bathroom which was round the corner and down a flight of stairs - was a bit worried we would loose revenue with the room but have actually made more money with 11 rooms than with 12! it also means 1 less car to park, 1 less breakfast to do, 1 less room to chamber maid, 2 extra large storage closets which were the private bathrooms of 5 and 6 - and finally and most importantly no guests who didn't read the description of private external bathroom and then complain on tripadviser and OTA's as if they were tricked into it. Best money we ever spent.